Black Sabbath • 1978 • Never Say Die! 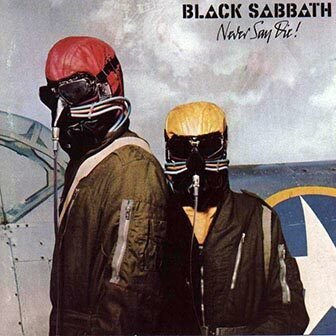 «Never Say Die!» is the eighth studio album by British heavy metal band BLACK SABBATH, released in September 1978. It is the last Sabbath studio album with OZZY OSBOURNE as the band's lead singer. Before this album was recorded, OZZY OSBOURNE quit the band and was briefly replaced by former SAVOY BROWN and FLEETWOOD MAC vocalist DAVE WALKER. Some songs were written with DAVE WALKERr, and the new group even performed an early version of «Junior's Eyes» with different lyrics on the BBC programme, «Look Hear». Osbourne eventually rejoined the band, refusing to sing any of the songs written with DAVE WALKER. These particular songs were rewritten, including «Junior's Eyes» (rewritten to be about the then-recent death of Ozzy's father). All four band members sing on «A Hard Road». The album was recorded at Sounds Interchange Studios in Toronto, as were parts of Technical Ecstasy. The sleeve was another by Hipgnosis and the US and UK releases differed slightly in the faint images seen in the sky. The inner-bag featured graphics in keeping with the sleeve and credits, but no lyrics. In the UK the title-track, released well-ahead of the album and the band's first UK picture-sleeve single, reached #21 in the chart and gave the band its first Top Of The Pops appearances since 1970. The band twice appeared live in the studio, miming to the song. One of these appearances was included on the official The Black Sabbath Story Vol. 1 - 1970-1978 video release, in a poor b/w transfer from a fan's off-air archive. In the UK the album reached #12, one place higher than Technical Ecstasy. In the UK «A Hard Road» was released as the second single from the album and reached the UK Top 40, 25,000 copies being pressed in a limited-edition purple-vinyl. There was no picture-sleeve release. Video from this period, professionally recorded on the UK tour at the Hammersmith Odeon in June 1978, can be seen on the Sanctuary Visual Entertainment DVD, also entitled, «Never Say Die». Wandering aimlessly, oh what can I do? Will Hitler beat 'em all?